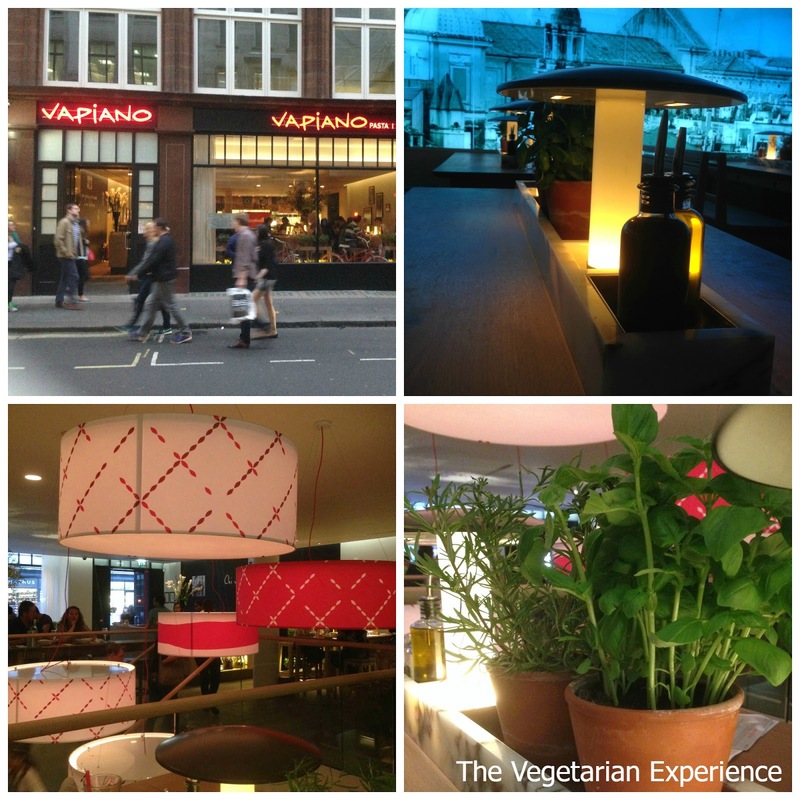 Recently we were invited to Vapiano in Soho to sample the Vegetarian menu. Vapiano in Soho is newly opened, and is one three Vapiano restaurants in London. There are around one hundred and forty Vapiano restaurants around the world. Vapiano is a restaurant which is a little different from the rest, in that it operates on a card system. You go to the counter to order your food and drinks, and you pay for the food at the end. The restaurant sells Pasta, Pizza, Antipasti and Salad which is ordered directly from the counter with separate counter's for each type of food. The food is prepared fresh in front of you, and then charged to your card. The restaurant's system reminded me of an upmarket fast food chain or modern school cafeteria. I quite like this idea in principle, however, I wouldn't say it works for everyone. There is also the danger you may lose track of what you are spending and get a surprising shock at the end. Decor/Feel of the restaurant - I really loved the decor of the restaurant. The counters are bright, fresh, and enticing. The dining areas are spacious, and yet intimate, and there are beautiful oak tables to sit at and dine. I also loved the lighting. There is a lovely mural on the back of the wall in the downstairs seating area. The Service - The service at this restaurant wasn't amazing. The manager and staff at the front desk were very friendly and helpful, but those behind the counters serving food and drink were a little surly and rude, and didn't really ooze customer service. The Set-Up - You have to queue up for different courses and mains, at different counters at this restaurant, so you queue up for pasta in one place, pizza in another, drinks somewhere else and starters in another place. Personally, this wasn't my cup of tea as I found it really disjointed and the restaurant was really busy, so we spent ages queuing for different things. The mistake we may have made when going to this restaurant was taking our children with us, as the premise of this restaurant is not really geared up for children. Although there is a nod to children with a children's menu, and colouring, the fact that you have to keep jumping up and down every two minutes to get food from different queues is not conducive to having children with you since you can't really leave them. Also, if one person wants pizza, and one person wants pasta, you then have to queue up twice, meaning that everyone gets their food at different times which does not really make for family friendly dining. However, I would add a caveat here and say that we were probably not the demographic who the restaurant is targeting themselves. The market this restaurant is targesting is most likely the London suburbanite or "lovey" who wants a healthier alternative to a fast-food joint, and perhaps just wants to pop in for a quick bite and leave. Indeed, there were quite a few actors/actresses who were "in between" their matinee and evening performances eating in the restaurant when we went. I am guessing that the set-up of this restaurant works in principle if you are on your own, or with a group of friends as it saves splitting the bill as you all pay for what you had. It does not work with children though, or if you are perhaps disabled or find it hard to walk or stand for long periods of time. I would have liked to have seen a table service option offered for those who may not find counter queuing an easy experience. 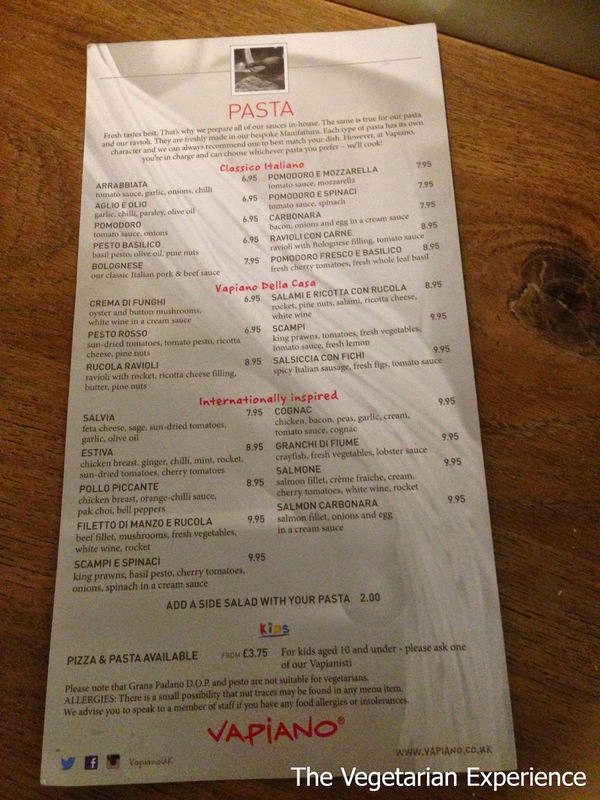 The Menu - There are separate menus for pizza and pasta. However, a big negative to the menu for the Vegetarian/Vegan is that nothing is labelled. There is no labelling system to tell you what is and isn't vegetarian. Of course some ingredients are quite easily decipherable as vegetarian but some aren't - such as Pesto. I asked one of the chef's if he knew whether the pesto was vegetarian, and he didn't know. There needs to be clarification on the menu. Additionally, the vegetarian selection is a bit hit and miss, especially the antipasti options. It actually took me quite a while to even decide what to order, as I had to scrutinise the menu so much. The Food - The food was a little above that of a typical buffet self serve fast food restaurant, however, being out on display all day, the quality and the freshness wasn't what I would expect of an Italian restaurant. It was evident nothing was covered to retain freshness, as things did have that "been out slightly too long" taste. The food was reasonably priced for a London restaurant, and was also quite pocket friendly too. We started off with the antipasti. I was disappointed there was not a vegetarian version of this, as the dish on offer was very meat heavy. The components to the antipasti were all just thrown on a huge plate in front of me without much care and attention. I was a little disappointed to find when I tasted the dish that cheese tasted a bit hard since it had been left out for a while and the bread was a little stale too. The vegetables were also off and I had to push them to the side of the plate. Additionally when preparing the Antipasti server, the girl behind the counter used the same gloves to put everything onto the plate - meat, cheese, bread and all, and didn't use serving implements. This is not great if you have vegetarians who will be sharing the platter due to cross contamination. I also ordered a Punpkin Soup, which was really delicious, but on the whole was a bit of a rubbish portion size, and was also not hugely warm. After ordering the Antipasti for us, hubby then left the table and queued up to order the kids Pizza's. The pizzas were made in front of him, and then we were given a buzzer take back to the table to wait for them to cook. My kids ordered ham and pineapple, and as you can see from the picture, the ham was just sloshed on the pizza, and two random pieces of pineapple chucked on as an after thought. It would have been nice to have them spread out evenly, or even cut into smaller pieces. Again, it felt very conveyor-belt like, with not much attention given to the end product. When we had finished our Antipasti. Hubby went up again to order our meals, whilst I stayed with the kids and helped them cut up their pizza's which had cooked and which I had collected. For main course, I chose the Mozzarella Pomodoro with Tagliatelle. He waited twenty minutes to get to the front of the queue, by which time, the kids had finished their pizza's and were starting to ask for dessert. After waiting twenty minutes to get to the front of the queue, hubby ordered my pasta, and was just about to order his, when the server went onto the next person's counter order, and said he could only order one meal at a time, and would have to queue again for another dish. You can guess what we thought of that. He had waited so long queuing anyway, and it seems that the server was unable to deal with making two meals for the same person at the same time. He bought my Pomodoro back to the table and was not happy. However, we decided to share the dish. We tucked in, only to find that although it looked very appetising and delicious, underneath, the taglliatelle was congealed, and stuck together, because it was cooked in boiling hot water in a deep fat fryer. There was also so much pepper and chilli put into the dish that we couldn't eat it - which is rare for both of us as we use lots of seasoning in cooking. At this point, we decided to cut our losses and leave. On the whole, I wouldn't say that we had a great experience here. However, as I said before, I don't think that we were the right demographic for the restaurant. I think if you were just nipping in for a quick bite, and were happy to get your own food, and, you eat meat, you would probably fare better. I would like to see the Vegetarian food improved - firstly by indicating on the menu what is vegetarian and what isn't. Then by introducing some more vegetarian friendly dishes. Also by encouraging good food handling practices in staff. 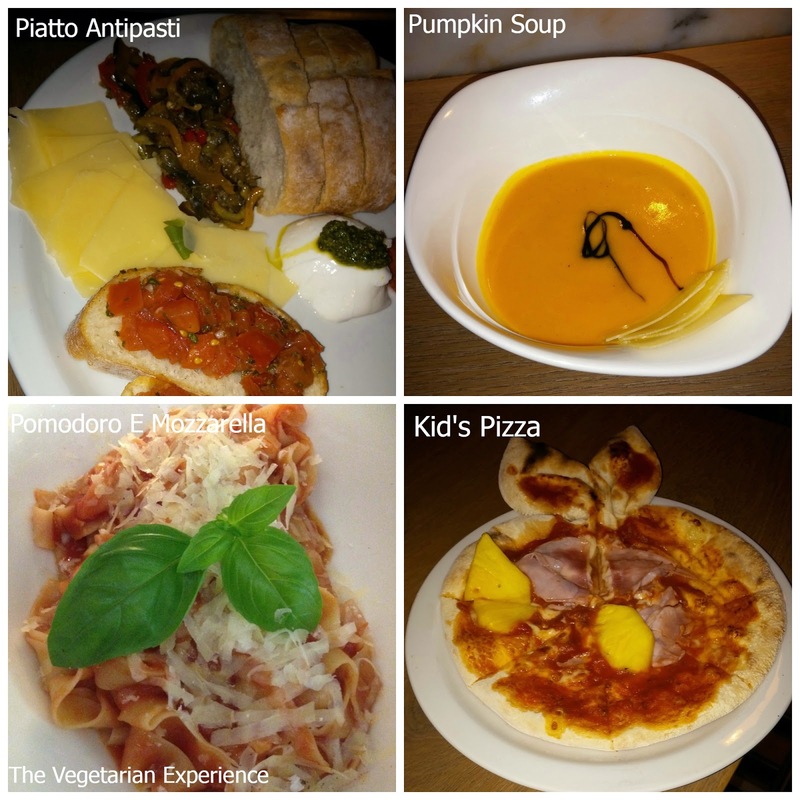 I probably would return to a Vapiano restaurant again, but I would return without children as I didn't find visiting Vapiano a relaxing family dining experience. It was really stressful having to jump up and down, leaving the kids, to then have to go to different places for drinks, starters, pizza and pasta, never mind the toilet trips all the way downstairs at the back of the restaurant. I think this is a good concept, but it doesn't work for everyone. Disclosure: Meal offered in consideration for review. All views are my own.